Photo Reflection of the Day #140: Beeautiful Again! 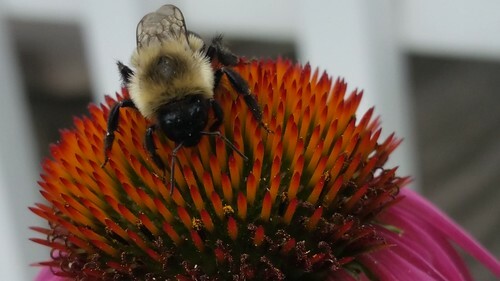 A picture of a bee gathering up some of the good stuff from a flower. Two bee picks so close to close. I know--it's probably overdone, but I have to admit, I couldn't say no to taking this shot and it is clearly the best shot I'll be taking all day. So what can you do? I'm amazed at the detail my cellphone camera can pick up. I'm also impressed with the range of colors in this particular photo. From the white fence background to the red, oranged and pink of the flower to the yellows and blacks of the bee. Also, check out the wings--such great detail that I don't think I would see with my own eye. I'm also fascinating with the pollen on the flower itself. I think this might be one of my best pictures of the year.